Store in Sygma the documentation that you use frequently, have it at your disposal at any given time and access to it with a Web browser. With the Documents function you can order your customers' documentation and access it whenever you want. 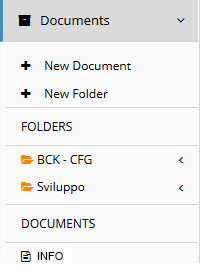 In Documents you can upload files in any Office-compatible format or create a document on the fly directly in Sygma. A Sygma document may contain attached files inside.